The Οργανισμού Απασχόλησης Εργατικού Δυναμικού (ΟΑΕΔ) or Organismou Apascholisis Ergatikou Dynamikou (OAED) is also known as the Manpower Agency of Greece, an organization that handles vocational training, job search assistance, labor and policy development, and unemployment and maternity benefits. To find an OAED office, you may have difficulty as a non-Greek speaker since the OAED website provides five English pages and no practical information, and the modern and better OAED portal (portal.oaed.gr) has disappeared. One option is to call ‘1500’ and inquire, or look below to find the one nearest you. Please note that these are central employment offices (Κέντρο Προώθησης Απασχόλησης/ΚΠΑ) where papers are filed and OAED cards are issued. Local administrative offices (Τοπικές Υπηρεσίες/TY) may not be at the same location or nearby. For example, I submitted all my paperwork at the central office but never visited again, showing my OAED card and getting signatures and services thereafter at the local office some distance away. If there is not an OAED location listed for your city or island, some business can be completed with OAED through a KEP Citizen Service Centre. You must appear in person and be prepared to complete everything in Greek. 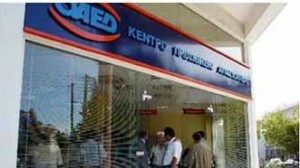 Only limited transactions are available online and in Greek. Greece typically lists offices by prefecture, then in Greek alphabetical order or no particular order, which is not helpful to most people. Listings below start with Athens and Thessaloniki, followed by elsewhere on the mainland and the Greek islands, with everything in alphabetical order. Some locations are being consolidated or moved under the Kallikrates program to save money, leaving the old information in place for reference. Use your browser to pinpoint the location you need. Go to ‘Edit’ –>’Find’ or ‘Find Next’ then start typing. Locations will be highlighted, or click the ‘Find Next’ button. *Based on OAED listings published December 2011, then supplemented with other sources and reader input to ensure accuracy. However, many changes are never announced and corrections are welcome. just came across this page looking for oaed offices in athens. have to admit that it was much easier than searching oaed site. greek is my mother tongue and i still couldn’t figure it out. I,m glad to find some information about living and working in greece in english. I live in sweden and I’m planning on going to greece and stay there for some time, looking for jobs. If I get the U2 certificate I have to visit an OAED office and follow their rules for 3 months in order to get unemployment funds from sweden. I wonder if you have any experience of the OAED in greece? I don’t know what to expect. I will live on an island and according to the list above they haven´t got a OAED office, does that mean i have to travel to the mainland to visit every time i have to contact the OAED? Do you have an email for OAED so i can ask them questions in english? a) I have first-hand experience with OAED but as a non-EU citizen, so that wouldn’t be incredibly helpful to you since you’re an EU citizen. b) You can complete some transactions for OAED by visiting a KEP Citizen Service Centre nearest your new residence. There are far more of them, and they keep longer hours. Find the locations in English using the link in the article. If for some reason they cannot help you, other arrangements will be made to ensure you receive your benefits from Sweden and they’ll tell you how. c) I added two email addresses to the article. In case you don’t receive an answer, please keep in mind that most staff only speak Greek and email isn’t a widely used way to communicate with the general public. Thank you for your questions. It forced me to see what’s new with OAED, thus giving me the opportunity to learn new things and pass them to my readers. If you would like to give back to this website in exchange for whatever information you find useful here, please come back and share your experience. I welcome input from all nationalities. Thank you, I,m very grateful for all help I can get. You’re welcome. It’s very easy for me to help readers like you. This site is so helpful.. Two-thumbs up! Hi there, cold greetings from Switzerland. I have tryed tried every part of the sites I could find with the name OAED as I am looking for the e-mail address of the Zakynthos office….. the one listed is wrong! has some one a good idea to find a proper adress address? thanks in advance for your help. That email address comes from an official list distributed December 2011. There is nothing more recent, though you could call and ask. Also be aware that many offices do not answer emails even when you use the correct address, since online transactions and email service are new concepts in Greece. Nearly all business is still conducted in person. I’m a teacher and need to register as unemployed in the summer, but will be moving to Paleo Psychikio and don’t see an OEAD OAED office that covers that area. The Ag. Paraskevi and Nea Ionia offices are near Psychiko. You can ask neighbors or call those offices and ask which location is the right one. Although it doesn’t apply to your case, it says at the beginning of the article that KEP locations fill the gap for some transactions when there isn’t an office in the area. Hi, Kat. Your web site is lovely and congratulations on doing such a fine job. I wanted to alert you to the fact that a certain OAED office has moved since last Wednesday 5 December 2012. It is the one that you have listed as “Athinon / Athinas”; it was previously located at Peiraios 52, but its new address is Stadiou 54 (on the corner with Em. Benaki street). Unfortunately, I do not have the post code and telephone numbers. Even more unfortunately, I found this out the hard way: I had been warned about the move on my last visit to Peiraios 52, yet the clerk didn’t know the new address. I searched the glowingly impressive OAED site for a notice of some sort, but no luck. Their phones were all out of order. So, I went to Peiraios 52 today and found the offices shut and a notice, which directed me to their new address. Had they been diligent enough to advertise the fact on their web site, I would have saved time and effort, but this – as you know well – is Greece! As you and I both know, updates of this sort aren’t always published by official websites (if at all) — which is why I’m baffled by people’s insistence on “official” info — and we’d be lucky to get a handwritten sign on the door. I’ll do my best look up the post code and phone number. Would you indulge me in a story that may make you feel better? An IKA office was due to change buildings, and movers came in the middle of the night to take away all the furniture and files. No one was notified, including employees who showed up on Monday and found all their stuff gone. Edo Ellada. Thanks so much for letting me know, giving back to the website and your kind words.